We are, thankfully, well positioned for this progress. The friendship of the American and Armenian peoples is long and deep, having been forged during the Armenian Genocide and strengthened over a century of hard trials and heroic triumphs. Our ties have strong roots in America’s commitment to Armenia’s freedom, Armenia’s devotion of democracy, and our shared vision for peace and prosperity. Armenia partners with America on a broad array of our national security priorities. A member of NATO’s Partnership for Peace, Armenia is the world’s 5th largest per-capita participant in U.S.-led peacekeeping operations, having sent deployments to Afghanistan, Iraq, Lebanon, Kosovo, and Mali. Despite its small size and limited resources, Armenia has accepted over 25,000 refugees fleeing Syria. As we end the centennial year of U.S.-Armenia ties and celebrate Armenia’s recent peaceful and constitutional revolution, America can count on Armenia as a reliable friend and regional ally. The first Christian nation, Armenia has enduring faith-based, cultural, democratic, and free-market connections to the United States, strengthened by the contributions that the two million Americans of Armenian heritage bring to every aspect of American life. As students in Sunday schools across America know, Noah’s Ark landed in Armenia upon Mount Ararat, the Apostles Thaddeus and Bartholomew preached in Armenia during the 1st Century, and Armenia became the first Christian state in 301 AD. 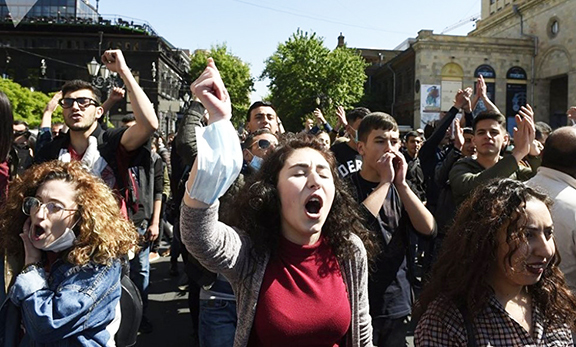 Landlocked, blockaded, and located in a tough neighborhood, independent Armenia today stands guard on the frontiers of faith and freedom – defending our shared democratic values in a region marked all too often by hatred and hostility. Having survived Turkey’s genocide and endured decades of Soviet tyranny, Armenia today faces dual blockades, and relentless Azerbaijani aggression against Artsakh (Nagorno Karabakh), an integral part of the Armenian homeland since biblical times. The U.S.-Armenia partnership is a vital key to Armenia’s ability to defend its freedom against powerful regional pressures. America must stand by our ally Armenia, affirming the deep civilizational ties between our two nations, celebrating our shared history – dating back to the time of American relief efforts for victims of the Armenian Genocide – and further strengthening our commonly held commitment to democracy, human rights, and religious liberty. We can and must do this in faith, freedom, and friendship. Faith: To start, America should speak honestly about Turkey’s attempted World War I-era annihilation of its Christian population, including Armenians, Greeks, Assyrians, Chaldeans, Syriacs, Arameans, and Maronites. The United States government and American civil society saved countless survivors, providing relief supplies to hundreds of thousands of Armenian and other Christian refugees through Near East Relief, a truly proud moment in American history. Our country’s credibility in condemning modern-day atrocities is undermined when, under foreign pressure, we remain silent about past genocides. No nation – particularly one as anti-American as Turkey – deserves a veto over U.S. policy on genocide, human rights, or religious freedom. We should reject any and all gag-rules and formally condemn and commemorate the Armenian Genocide. Freedom: In keeping with our American commitment to freedom, we should openly support and materially aid Artsakh, a predominantly Christian land forcefully stripped away from the Armenian homeland by Soviet strongman Josef Stalin and arbitrarily placed under the hostile, anti-Armenian administration of Muslim-majority Azerbaijan. The citizens of Artsakh long aspired toward – and have now achieved – the same democratic freedoms that we enjoy as American citizens – the right to live, in freedom, under a government of their own choosing. For this, they have come under constant attack by the corrupt Aliyev petro-monarchy that has ruled Azerbaijan for nearly all of the past half-century. If the horrors ISIS committed against religious minorities have taught us anything it is that failing to hold Azerbaijan accountable, or, even worse, forcing the free people of Artsakh under Azerbaijani rule, would place them at risk of genocide. American humanitarian and development assistance to Artsakh – including de-mining work undertaken by the HALO Trust – represents a key investment in peace, one we should continue and also complement with U.S. recognition of Artsakh’s independence. Friendship: And finally, America should strengthen our bilateral ties with Armenia, meaningfully upgrading political, economic, military and cultural relations between our governments, reinforcing the enduring friendship of our two peoples, and expanding our already strong cooperation on international peacekeeping operations. As Armenia completes its aid-to-trade transition, U.S. trade and investment promotion initiatives have taken on added importance. The growing commercial focus of bilateral ties underscores the necessity of new accords – such as a Double Tax Treaty and Social Security Agreement – and bilateral platforms, including our joint Economic Task Force and Trade and Investment Framework Agreement Council, in facilitating mutually beneficial economic cooperation. We can and must also help Armenia, a cradle of Christianity, to realize its potential as a regional safe haven for Christians and other at-risk Middle East refugees. On all these issues, the White House and Congress should ensure that 2019 marks a successful pivot from Armenia’s successful elections to concrete progress in strengthening our bilateral strategic partnership. USA has no real desire nor interest to support Armenia, Armenia is insignificant to them with zero value. The only value Armenia is to USA is as a weak tool to annoy Russia. Do not be fooled by the huge lie that is democracy, dozemns of nations were used as tools, wars started entire cities destroyed so as allow the western nations to play their games, from Iraq to Syria, Afghanistan, Libya, all of them used as a need to push democracy and then destroy them. I agree 100% Armenians should be careful to hambo jambo games. bravo Aram, excellent yearly message. Armenia is definitely a country the US should take seriously since it is truly democratic now, versus its past transitional phase. many surrounding countries are no where close to what we have achieved in Armenia and they can trust the representation made by the government. Armenia’s government is eager to work with the US in many areas that benefit both. Do not hold your breath, US can’t be trusted, look what’s happening to Kurds.